As I have said before, I am an ex-100m sprinter and I was a decent standard of rugby player before that. I get moving fast and changing direction at speed. Therefore, I barely even thought of movement when I started table tennis. Forgive me, but I have seen some pretty big people play table tennis as well as some rather old ones to. None of them made me believe that table tennis would require me to fire any of my fast twitch fibres. Yet, over 9 months in and I find that movement has become my biggest obstacle. For movement to be understood we need to break it down into "chunks". There are three of these chunks that need to be considered. The first is positioning. This includes the body position i.e. the crouched, bum out, bent over, old lady look and the position of the individual relative to the table i.e. where they are when the ball is played. Secondly, there is the anticipation i.e. understanding how and where to move when the ball is played. Finally, there is the movement i.e. where and how the individual moves once the ball has been played. These chunks are vital to the best players, especially those who want to play an attacking game with spin. This is because spin is based around a fine contact with the ball. A delicate contact is only possible with a shot almost perfectly executed every single time. So lets have a look at the first part. The position. My body position, these days, starts off well before points. I stand waiting to receive serve like a seasoned pro. I adopt the "old lady" position, bent over with a slight hunch and my shoulders rolled forward. The bat is help in my hand loosely in a neutral position out in front of me with my other arm in parallel. Between shots, though, I find it much harder to return to that neutral position. Let's take a forehand. The principle is that I move, play the shot and then return to the neutral position. This requires, not only a movement for the shot itself but a second movement to return to a state whereby I can play the shot. Returning to this state requires an extra component after every single shot. In terms of the forehand this creates an oval shape with the bat (see below). It also requires the body to drop after every shot. This is because, when you play the forehand, the body will rise up and forward slightly on every drive (this "upward" movement is even more pronounced on a loop). The position is vital between shots as it means you can go either to the forehand or the backhand. I noticed in myself yesterday that if you return to the neutral position after a shot, if you get caught out being too far over to one side of the table, you can adapt and play a decent shot even if it might be a backhand from the forehand side, for example, just don't make a habit of it! So, you have got back into the neutral position, you are low to the table. You can go either way. Everything is perfect. Now what? Sadly, the fun has just begun. Now comes the bit you cannot control, your opponent will play a shot (serve) towards you. You, the receiver, will need to decide where to move. I think this is fundamentally where "experience" comes in, in table tennis. That innate ability to see what the opponent is going to do almost before they know themselves. Ben will often be in the position to take a shot that I have made before I have actually made the shot itself and he is not the only one. Older players rely on this knowledge to enable them to get to the ball, as their movement might not be as sharp as younger players. As an inexperienced player I find this really hard. I am so focused on what I need to do that my brain is very inwardly focused. That is where I often panic. The panic really stems from not being 100% comfortable with what I do internally. I am focused on remembering my forehand or backhand technique or how I need to connect with the ball or how I am going to stand to actually look at what my opponent is doing. Then when they do something I am suddenly panicking because I have been focused on myself for the last second or two. It turns out that focusing on the opponent is as important to movement as the movement itself. Unfortunately, it is liable to be the last thing anyone learns because it takes so long to see the cues that indicate what the opponent is going to do. With Ben I have tended to do a lot of drills associated with a known movement parameter. For example: backhand left of table, forehand middle of table, forehand wide, forehand middle, backhand left of table. These drills mean you move but it is always a known quantity. It may be a year or two before I can honestly feel comfortable with my own play to concentrate fully on my opponent. Our opponent this time, we have correctly deduced is going to play a shot into the corner, forehand side. It is coming quickly but you have time to get there. You need to stay low, keeping the old lady/crab position. You have to drop the bat at the same time as you take a side step that kicks one foot into the side of another and then the other foot reaches across. If you look at the video below you can see that side step motion of Ryu Seung as he gets across the table. That is the aspiration! A lot of what Ryu Sueng is doing is stuff me and Ben do. The side step, gets more complicated however with the addition of a Y Axis i.e. backward and forward movement. If a shot comes in to that corner. And you aren't quick enough to the ball you can take a diagonal side step. This will give you time to "pick" the ball up (take it from lower) and top spin it back to the table. Weight transfer is key in movement. I thought it was only because of creating power at first, but now I realise its so I can spring off one leg and back across. The twist of the body (from the back foot to the front foot) allows me to not get stuck in one place. This, for me, is really tough and I have to work on it an awful lot to both remain low and twist effectively. It can be pretty tough to get the whole thing together. Movement is such a combination of skills that if one breaks down it can pull the whole thing down like Jenga. 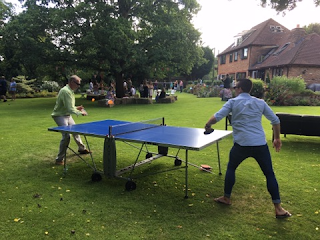 It, like all of table tennis, requires a relaxation, which doesn't come naturally to me. If I am nervous I can often end up flat footed playing soft shots that benefit my opponent more than me. However, it does separate the top players from the local league guys. It is something I genuinely feel, that if I get it right, will pull me up to the next level and help me start to bridge the gap between myself and those in leagues above me. It will also help stop any random loses I get against lower level players, which is something I still feel is a risk, although it is decreasing. In summary, I guess movement, for me feels like a big change. I have to work so, so hard at it but I feel the rewards are worth it. I often shadow play it and both Karl and Ben have been working hard with me. Improvement is there but it can make me worse in games as I tense up even more than usual. The shoots of performance increase are appearing though and in a month or two I can tell I will be a different player yet again. You can on also now follow me by clicking the buttons below! You must be a kind people because you share your knowledge through articles.They contain pieces of advice.I wish you best things in life. This is a great inspiring article. I don't know what to say except that I have enjoyed reading.Some genuinely interesting info , well written and loosely user pleasant. It's great to be able to read the author's shared lines, wish you always success, and have more great postings. Hi! Thanks for the great information you have provided! You have touched on crucial points!Pretty good post. I just stumbled upon your blog and wanted to say that I have really enjoyed reading your blog posts. Any way I'll be subscribing to your feed and I hope you post again soon. Big thanks for the useful info. Today, I was just browsing along and came upon your blog. Hi was just seeing if you minded a comment. i like your website and the thme you picked is super. I will be back. Nice to read your article! I am looking forward to sharing your adventures and experiences. Yet while normal and understandable, this is also something that's addressable. (Not entirely fixable, of course, but at least addressable.) But facts aren't the way to do it -- simply getting better at announcing the who, what, where, and when of things won't really convey the flavor of this lively place. For that you need stories.